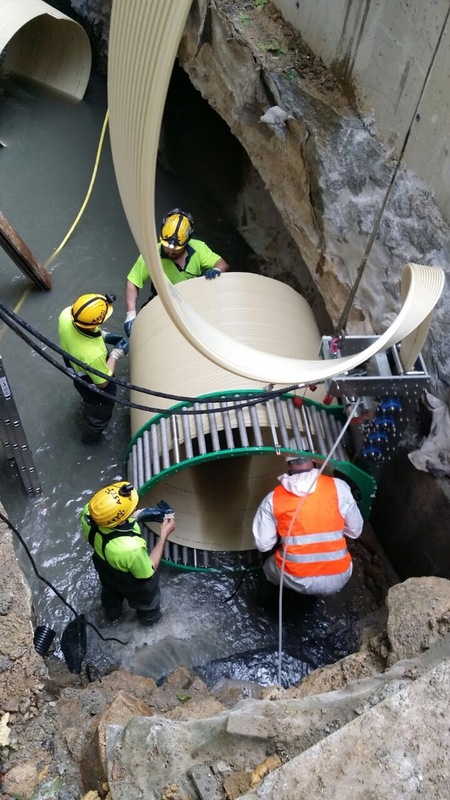 SWL Spiral Wound Liners (https://youtu.be/NU3STc_tVnU) can be used to rehabilitate gravity pipeline applications such as storm sewers, sanitary sewers, conduits, culverts and process pipes. The configuration of spiral wound liners often allows installation of the liner without the use of over pumping. 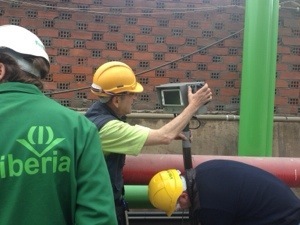 The liner is installed in-situ in the host pipe through a manhole or insertion pit. Profile strips of PVC, steel reinforced PVC or HDPE located on spools above ground are fed to a winding machine. The winding machine rotates causing the edges of the profile strips to interlock forming a water-tight liner. The rotational action advances the liner through the host pipe. In smaller diameter pipes, the liner can be expanded by the winding machine to form a tight fit with the host pipe. Alternatively, a fixed diameter, field-fabricated liner can be installed, and the annular space between the host pipe and liner grouted. The winding machine can remain stationary at the inserting pit in line with the host pipe, or for larger diameter circular or non-circular applications, the machine can travel along the host pipe. The traveling machine installs the spiral wound liner in contact with the host pipe forming a close-fit liner that generally conforms to the profile of the host pipe. Or the liner may be installed with a fixed dimension and the annular space between the spiral wound liner and host pipe grouted. 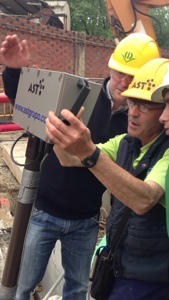 Laterals are located by measurement and reinstated after lining. Grouting of the annular space is generally preferred to lock the liner in place, effectively transferig external loads from the existing pipe onto the liner and to mobilize the support of the existing pipe to achieve the full potential of the liner to carry external loads. Entrada publicada en Novedades on 25 mayo, 2015 por AST Grupo. El estado de pozos, arquetas y tuberías es inspeccionado de forma rápida y segura gracias a la PÉRTIGA TV, sin necesidad de acceder a espacios confinados. Entrada publicada en Novedades y etiquetada como inspeccion de pozos, inspección de tuberías, pértiga tv, robot tv el 14 enero, 2014 por AST Grupo.